Friedman Fine Art offers a diverse collection of historical and contemporary photographs in Chicago. At 275 feet, the Fisher Building is a 20-story neo-Gothic landmark, located in the Chicago Loop at 343 South Dearborn Street. The building is known for its interesting terra cotta tracery, or carvings of aquatic creatures including fish and crabs on the lower floors. There are carvings of eagles, dragons, and mythical creatures on the upper floors. 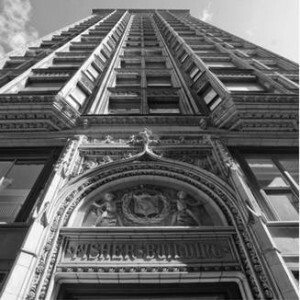 Designed by Charles Atwood of D.H. Burnham and Company, the first phase of the Fisher Building opened in 1896. This 18-story building measured about 230 feet tall and was the second-tallest building in the city at the time. Its steel frame took only 25 days to complete. An addition on the north side of the building was made in 1906, which raised the building from 18 to 20 stories. Former employee of the Burnham firm Peter J. Weber, designed and oversaw the addition, which was completed in 1907. The interior of the building was decorated with expensive materials. Many of the floors had colorful mosaic designs. The wainscoting was composed of Carrara marble and mahogany wood was present in its the trim. Today, the Fisher Building is the oldest 18-story building in Chicago that has not been demolished. It is currently owned and managed by Village Green Management Company, and has apartments on floors 3–20 and commercial stores on the first and second floors. To purchase this vintage photograph or more Chicago photographs.